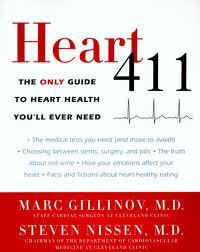 Heart 411 is an excellent new book by Marc Gillinov, M.D., and Steven Nissen, M.D. from the Cleveland Clinic. The book doesn’t focus on athletes specifically, but the authors have assembled a comprehensive, 550-page guide that deals with all aspects of heart disease prevention and treatment. The book would be a valuable reference to athletes of all sorts. If you’re looking for an authoritative, comprehensive guide to heart health, this may be the book for you.